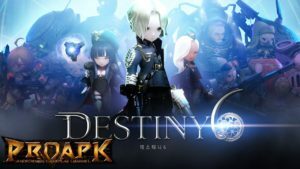 Destiny6 is a new action RPG for Android by Netmarble soft-launched in few countries[Asia only]. But if you want to play Destiny6 right now on your Android device then you should read this post. Destiny6 is a strategic Action RPG featuring a simple tap-and-drag control system as well as distinctive charcters and skills. There are 6 factions and their responsive heroes, of which five have been revealed: Selvas, Inuna, Traga, Jin, And Medina. You embark on a journey full of secrets and mysteries in order to find 6 destined heroes who can save the world. You can manually control heroes by tapping on the screen. Skills help you to win battles. Dragging a skill will allow targeting a specific enemy or a particular area. Mid-sized or bigger monsters have a moment of weakness immediately before or after using their specialized attack, and this is indicated by a red light. Use the Break Skill (red) with the right timing and the monster will be incapacitated for a set period of time. When in Break (incapacitated) status, enemies take a higher amount of damage, making it the opportune time to release an onslaught of skill attacks. The strike gauge fills during battle based on damage dealt and taken. When it reaches 100%, the strike button will activate. Graphics of Destiny6 are brilliant, force you to play the game non-stop. You can get the Destiny6 game from here[Google Play Store]. If Destiny6 not available in your country! First, you need to download the Destiny6 apk[get it here]. Download a VPN app[necessary] from google play store[Recommeded – Express VPN]. Once installed, open it and choose Singapore region. Open it and let the game download patch[files and assets]. ⇒Subscribe Us, Contact Us, If You Have A New GAME Suggestion Then Please Submit Here.